Investiture of Cristofanus and Cecilia as Baron and Baroness of Altavia. Argent, a Fret Sable, and on a chief Vert, a Laurel Wreath Argent. We invite one and all to help us make Altavia’s 31st Anniversary a stepping stone to the Future! Join us May 10, 2014 at Veteran's Park in Sylmar as we as celebrate THE COLORS OF ALTAVIA with all our Excellencies Past and Present! Witness the stepping down of our beloved Baron Secca and Baroness Meliora !! And then 'Hip Hip Huzzah' for their Heirs, THL Cristofanus Castellani and Mistress Cecilia Medici, our shiny new B& B’s !! Highlighting the day will be the search for new Altavian champions in Armoured, Rapier, Unarmoured, A&S, and Youth !! So, just how many shades of Green, White, and Black can YOU wear as we celebrate the day ?? Our Armoured Combat, Rapier, Unarmoured, and Youth tournaments will all be standard double-elimination style. 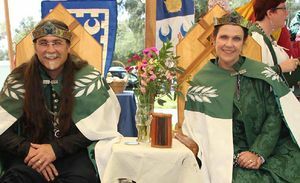 ~ Our Arts and Science Competition is open to any creative art or science, functional or not; and entries inspired by the Baronial Colors of Vert, Argent, Sable (Green, White, and Black) are greatly preferred !! The New Champion will be decided by a People’s Choice competition, so please remember to come by and cast your vote !! All entries must be in by 2 pm, but voting will run until just before closing court. This page was last modified on 11 June 2014, at 21:55.